The audition process is well-known to be a nervous and exciting one for performers, bringing that familiar feeling of nerves and anticipation that can be so addictive (and dreaded) for those on the stage. However, to share a little secret, it's pretty much the same way on the other side of that table, too. Performers feel the stress and tension of putting themselves out there, but directors, producers, choreographers, stage managers and the others on the other side of that table feel similar things because they want so badly for performers to do well, to be what they want them to be. Step 1. Secure an audition space that fits your needs. If you're casting the next big thing, you may need to accommodate hundreds of auditioners. But if you're familiar with your market and are just expecting a few dozen people, then a local music room or practice space will also do just fine. 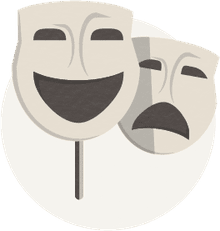 If you're not using a traditional auditorium, which separates you from the performers naturally through the stage, backstage, and house areas, then make sure to allocate two separate areas for your auditions. These will include the room in which auditioners will wait, preferably outfitted with enough seating for at least a dozen or more people at a time, and then a private area with a table and chairs, at which you and your associates can confer. Step 2. Make a list of the most important roles to be cast, along with their age ranges, genders, and other potentially helpful info, however, don't let yourself be boxed in here creatively. Don't just be color-blind when casting, but where possible, be gender-blind as well. Get rid of your preset ideas about character and see what you get in the audition process -- you may be pleasantly surprised! Once you've listed out the roles to cast, you'll want to rank them according to importance. The tougher the role is to cast, the higher it should be on your list. Make supplemental lists of supporting characters who can be easily cast from those who do not make the cut for the leads. Date, time, and place of auditions (including street address and the name of the venue, if applicable). Other Info: Make at least a general note of when the production is slated to rehearse and run so that those with unavoidable scheduling conflicts won't waste their (or your) time. Contact Information: Include a name, e-mail address, and phone number with voicemail (preferably a business phone or a number that will not interrupt you after hours). Be clear about what you're looking for. Be concise when describing each role you'll be casting, and what you're looking for. Remember to stick to the spirit of the character while getting rid of preconceptions. Also be clear about attire. If there's going to be some dance and/or movement or even tumbling, let the performers know so that they can dress accordingly. Post announcements on your website, in your newsletter, and in an official press release from your organization. Send out that press release to all local newspapers and performing arts press, online and off. Post the notice wherever you can on bulletin boards or classifieds on a local (or national) industry basis, where budget allows, from Craigslist to Backstage, Playbill, and more. Step 6. Create and print information sheets for all auditioners. (I've posted a sample form you can use or recreate in PDF here.) Bring a stack of copies to your auditions, making sure to have ample information sheets for all potential auditioners. Step 7. On Audition Day, show up with your associates at least 30 minutes early to set your table or area and prepare. Make sure you post signs or flyers on audition day on the outside of the entrance, as well as in the hallway to point the way to your room if necessary, in big, clear lettering. For musicals, make sure you have a piano and accompanist present for the entire audition period. It’s also not a bad idea to bring a cooler with bottled water or sports drinks inside for auditioners who get faint or overstressed. It doesn’t happen often, but it’s a good idea to be prepared. Bring extra pens and pencils, as well. As you begin, have all auditioners fill out the information sheet, and then give it back to you along with a resume and head shot. Step 8. Be respectful during the audition itself. While it's normal to touch base or confer quietly a moment or two with your associates during the audition, don't talk at length while the performer is speaking or singing -- wait until they're done. Anyone who's ever been on the other side of that table knows how unpleasant it is to have to audition for someone who is inattentive, dismissive, or unpleasant, so give all auditioners your polite and professional attention, and be sure to thank each person when they're through. Step 9. Keep things moving along. Don't argue or pause for extended lengths of time -- save your discussions for later (or during callbacks). For now, try to provide equal time to each auditioner. Where necessary, ask for alternate monolog or song choices from promising performers to show more range, but stay focused and brisk on time so that auditions move along efficiently. Don't forget to take clear written notes (or better yet, tape the audition process if you can). Note specific details, such as "good voice," "belter," "great monolog," "good emoter," etc. While you might swear each performer will be burned on your brain, at the end of a few dozen (or hundred) auditioners? Not so much. Step 10. After auditions, organize the forms of your most promising performers by potential part for callbacks. And keep in mind that you don't have to have callbacks at all. Depending on the piece, and on the people you've seen, you may already feel that you know what you're going to do with your casting. But if there's any doubt at all, or especially if you're waffling between two or more performers for crucial roles, don't be afraid to hold callbacks, so that you can really judge who's the best choice. Step 11. Contact auditioners for callbacks with precise information on when and where to show up for the callback. Be pleasant, brief and professional. Don't overpromise, and don't let yourself get roped into conversations about the performer's chances. Leave all your options open until the callbacks are over. Step 12. Conduct your callbacks with the same organization and focus with which you held your initial auditions. For callbacks, try not to depend too much on cold readings -- instead, examine the actors' choices, their eyes, their movements. I'm personally somewhat leery of leaning too heavily on the cold reading performance -- there are many performers who are terrific cold readers, but who afterward never quite find the electricity beyond that initial take on the character. That's not to say that good cold reader are bad performers! Simply that it's dangerous to judge a final performance from a cold reading. I've known many actors who were sensational actors, but just terrible at cold readings. For me when casting, it almost always comes down to that certain zing of energy. The right people just have a certain spark to them. Step 13. Meet with your other casting associates for a last, quick once-over to make sure to make sure that whoever you're casting will meet the criteria. Can your Fagin dance? Is your Peter Pan afraid of heights? Can your Valjean lift a grown man and toss him over his shoulder? All important considerations. Step 14. Contact the auditioners about the results. For those who didn't make the cut, give the bad news first, then the good -- for instance, let the actor know that while you went in a different direction when casting the role of the lead so-and-so, you think the actor did a great job and would make a smashing (insert alternate character name here), if they're willing to take on that part. For those who simply did not make the cut, be pleasant, regretful, and kind -- and get off the phone. Don't draw it out, just thank them for auditioning, and let them know that you hope they'll audition again for future productions. Step 15. Post the final cast list on your door, website, or other appropriate location. Don't forget to do a press release!